Manuel, shown with his family, first came to the United States illegally more than two decades ago. He was one of the 143,470 immigrants arrested in the interior of the country last year by immigration authorities. 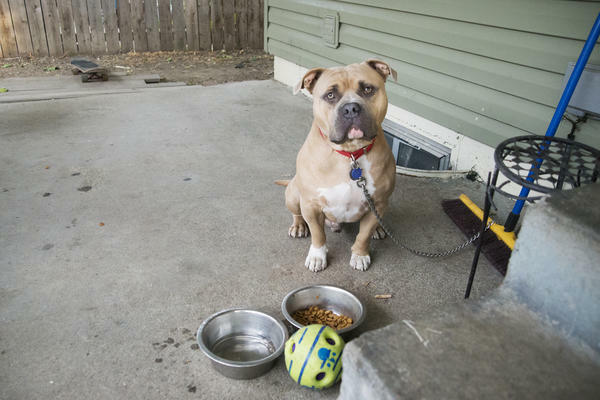 Royce, the family dog, sits on the back patio of the house where Manuel, V and their children live in the Pacific Northwest. 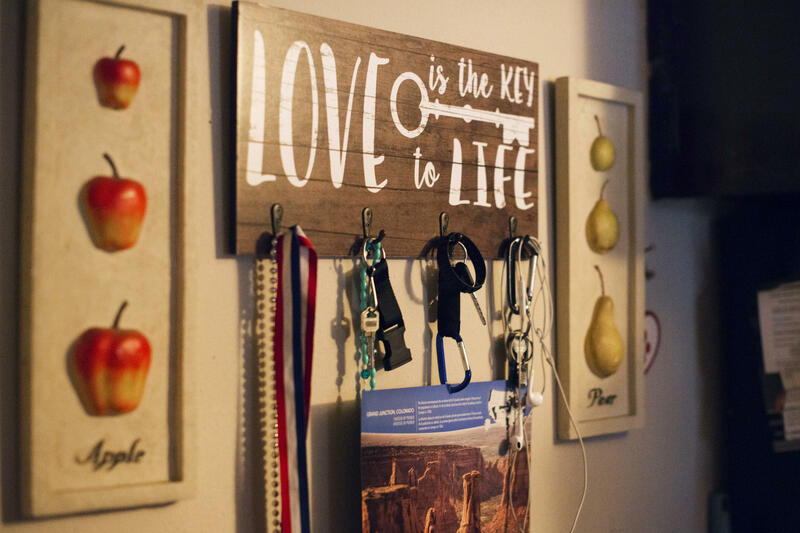 Keys hang by the backdoor of Manuel's house. The whole family was affected by Manuel's detention. Their oldest son had to drop out of college to support the family. Their younger sons, usually upbeat, began crying at school and some of their grades dropped. Manuel and his wife hold hands. He first crossed the border in 1995 after threats from his wife's relatives, who didn't approve of the relationship. 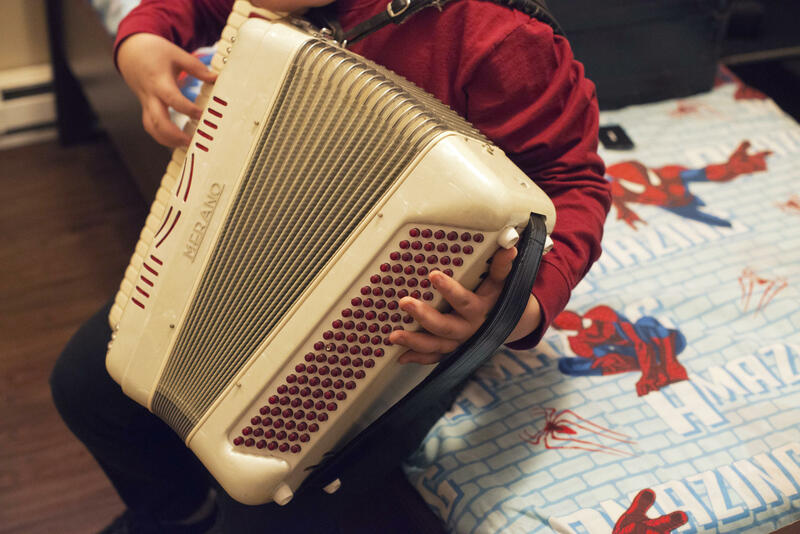 Alex, 14, plays the accordion in his bedroom. He has been learning how to play one of his dad's favorite songs, La Puerta Negra, or "The Black Door." His grades suffered during his father's detention. Three of Manuel and V's sons play on the trampoline in their backyard. Manuel was away from his family for six months. The detention center where Manuel was held is hours away from where his family lives. When his first request to stay was denied, he was escorted out of the courtroom without even seeing his kids, who had traveled for the decision. On the day he is released, Manuel is hugged by a friend at the detention center. The fact that he had a lawyer greatly improved his chances of avoiding deportation. After his release from detention, Manuel walks with one of his sons near the local elementary school. Manuel still hasn't received proper documentation to work. As a result, the oldest son remains the family's biggest breadwinner, and his schooling is left on hold. He would get to put on the team jersey — purple, with a camouflage print collar. And most importantly, his dad, Manuel, would be there, cheering from the sidelines. Instead, Alex woke up to his mom screaming and crying outside his bedroom door. By the time he got out of bed, it was too late. His dad was already gone — on his way to the county jail and then to immigration detention, where he would spend the next six months waiting to learn his future in the United States. Manuel came to the United States from Mexico illegally two decades ago. He is one of the 143,470 immigrants arrested in the interior of the country last year by U.S. Immigration and Customs Enforcement authorities. These kinds of arrests are up 25 percent compared with in 2016 — part of an effort by the Trump administration to fulfill a campaign promise to deport more immigrants who have come to the U.S. illegally. Manuel's story points to a broader policy directive of President Trump's first year in office. At a time when arrests at the border are at a 46-year low, the federal government has begun to go after people who were not targets under the previous administration: those in the U.S. interior who have lived in the country for years and who often have committed no crimes. In 2017, arrests of undocumented immigrants with no criminal record increased by 42 percent compared with in 2016. 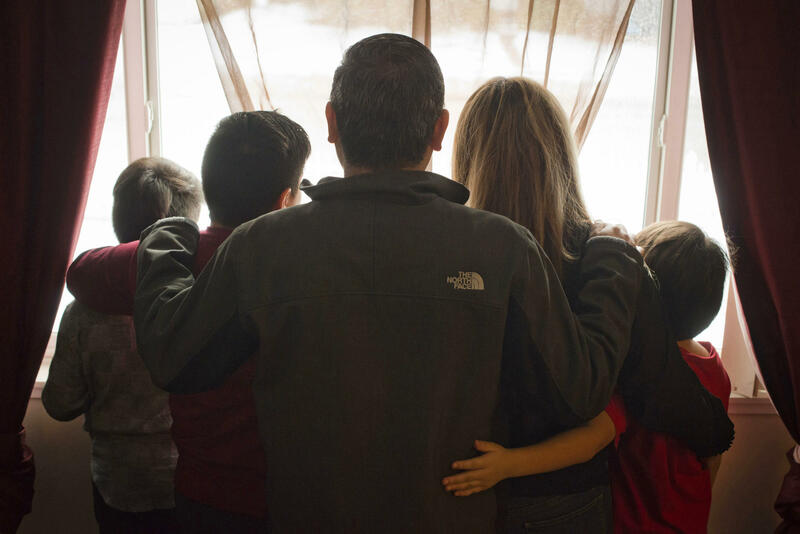 Manuel's case illustrates not only the giant, complicated bureaucracy involved in immigration enforcement but also the ripple effects one arrest can have on a family and a community. NPR obtained Manuel's ICE file, which confirms the details of his history in the United States. At the family's request, NPR has obscured some family member's names and left other details vague because of their status in the country. Manuel and his wife, V, grew up together in Sinaloa, Mexico. When they started dating as teenagers, V's family objected: Manuel was from a poor family, and V from a wealthy one with ties to the powerful Sinaloa drug cartel. Manuel first crossed the border in 1995, when he was still a teen, after V's uncle tried to kill him by running him over with a car. Another time, the uncle put a gun to Manuel's head. When Manuel returned to Mexico in 1997 to marry V, her relatives beat him up. Faced with near-constant threats, Manuel attempted to return to the U.S. in early 1998. That time, he was apprehended. He could have asked for asylum then, but he was 19 and didn't understand immigration law. He was sent back to Mexico. Three days later, he crossed the border again, this time successfully. 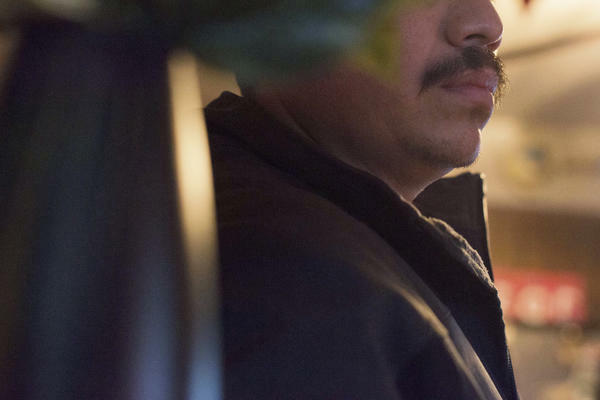 Now in his late 30s, Manuel was living quietly under the radar in the Pacific Northwest when immigration officials showed up that Monday morning in April. It was 5:30 a.m. He was preparing to leave for the first of the three jobs he worked to support his family. The agents said they came to investigate a report that Manuel was driving a stolen car. He had owned the car for years. When asked later, police couldn't produce any reports about the stolen car. Then the agents asked Manuel for documents to prove his citizenship. He didn't say anything. They told him he had a deportation order from 1998. The agents put Manuel in handcuffs. He asked the officers to let him say goodbye to his wife. He didn't get to say goodbye to his kids. Apart from his illegal entry into the United States, Manuel had not been charged with any crimes. His son Alex didn't make it to school that day. He did go to his football game, but he couldn't stop thinking about his dad. Alex's head wasn't in the game. Eventually, the coach pulled him off the field. Within a few weeks, Alex's grades had dropped so much that he wasn't allowed to play at all. Over the next few months, Manuel tries to talk to his sons — age 8 to 19 — on the phone every night from the detention center where he is being held. "I tell them that they have to put a lot of effort into their schoolwork because they don't have to pay for my error," he says. Manuel remains hopeful he'll get to go home. But he has also watched many of the friends he has made in detention get deported. The Trump administration is looking to expand the government's capacity to detain immigrants in the country illegally. In May, the Department of Homeland Security asked Congress to fund 17,000 new beds in detention facilities — one-third more than the system's capacity at the end of the Obama administration. That request comes at a time when the number of people crossing the border is lower than it was at the beginning of the Obama administration or during the George W. Bush and Clinton administrations. By the end of the Obama administration, the number of border crossers was actually dropping — and that trend has largely continued during the first year of the Trump presidency. Decreased border crossings means more resources can be used to expand deportations in the country's interior. Last January, ICE agents got a memo stating that "officers will take enforcement action against all removable aliens encountered in the course of their duties." That memo was written by Matt Albence, director of enforcement and removal operations at ICE. He has been at the agency for six years, and as he sees it, officers' hands were tied under the Obama administration. "The laws that Congress has passed and that our offices are sworn to uphold, we are now executing them faithfully across the board," Albence told NPR in December. To be clear, President Barack Obama deported thousands of people each year, too. But under a 2014 executive order, Obama directed immigration agents to focus on two groups for deportation: border crossers upon entry and illegal immigrants with criminal records. The government would not target noncriminals in the country's interior. In 2016, the last year of the Obama administration, these types of arrests accounted for 2.1 percent of total removals. In 2017, that figure climbed to 6 percent. Albence said that about 90 percent of the people arrested by ICE have had a prior run-in with the courts. That 90 percent includes people like Manuel, who had that deportation order for crossing the border 20 years ago. 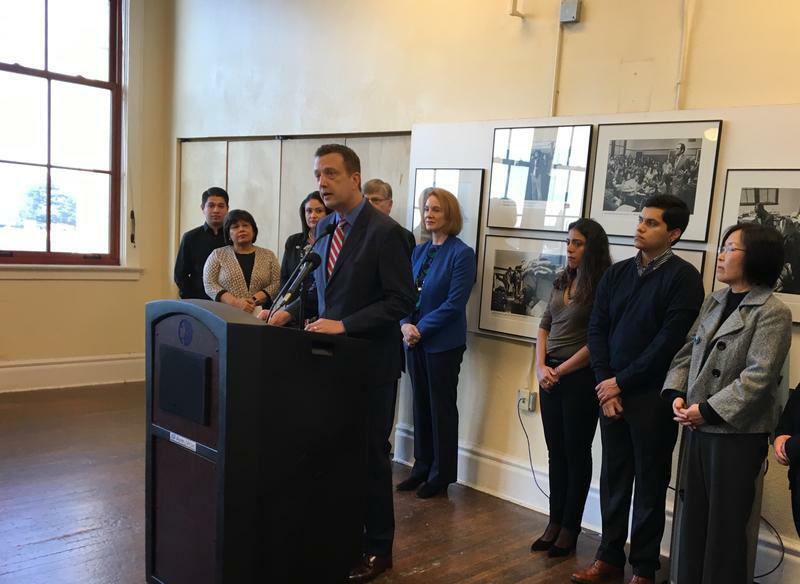 Anyone in the country illegally should know they are subject to deportation, Albence says. "There's certainly a humanitarian perspective where you can feel sympathy for the individual and their circumstances," he said. "But that does not mean we're not going to enforce the law." Albence says anyone who is in the U.S. illegally should stop violating the law. And if there is no way for them to get legal status — through family or employment — he says self-deportation "is certainly an option." For people who've grown roots in a community, and raised American kids, self-deportation doesn't feel like a possibility. And when one immigrant is locked up, that absence is felt acutely. Manuel had been paying for his oldest son to attend college. That son now has to leave school so he can work as a firefighter to support the family. The oldest son is what is known as a DREAMer, a child brought to the U.S. who has temporary permission to stay in the country under DACA, or Deferred Action For Childhood Arrivals. That program could end in March unless Congress acts, so he fears for his own future as well as his father's. At last in mid-September, after nearly half a year in detention, Manuel gets his day in court. He has seen his kids once in all that time. The drive is far. But they make it this day. If Manuel loses, the next time he leaves the detention center could be with a one-way ticket to Mexico. The courtroom is cold and sterile. The judge tells Manuel she is denying his request to stay. Visibly upset when the judge issues her ruling, Manuel is escorted out of the room. He is not able to see his kids. "I'm angry, upset and confused mainly," the oldest son says right afterwards. "I couldn't even say bye. Especially after they told him, I couldn't even look at him in the face and say bye. That was pretty painful." Manuel is not deported immediately. He has to decide whether he'll fight the ruling and stay behind bars — perhaps for months longer — or accept the judge's decision and try to make some money in Mexico to support his family back in the United States. Manuel's oldest son isn't optimistic. "He has the right to appeal, but it almost seems unnecessary, and also seems like no matter what he does, they're going to f****** reject him," he says. "I mean, I might as well leave, too. I might as well go back to a country I've never been to. This is the American dream, you know? We're living it." In a moment of despair, Manuel calls V and tells her to send all his clothes back to Mexico, so he'll have something to wear if he is deported. Manuel does have one thing going for him that most immigrants don't: a lawyer, Andrea Lino. According to the American Immigration Council, 85 percent of people in immigration detention don't get a lawyer, in part because it can be hard to find one while behind bars, and detainees in immigration court aren't guaranteed one. But having one makes a clear difference: Detainees with lawyers are released 44 percent of the time, compared with 11 percent for detainees without them. While Manuel is deciding whether to appeal the ruling, his elderly mother gets a phone call at her home in Mexico. The menacing voice tells her that Manuel was deported and that members of the Sinaloa cartel kidnapped him at the border. The caller demands a ransom and threatens to kill her son. She knows this is a bluff and that he is still locked up in the United States. But she also knows that the threat of violence is real. She has seen the cars circling the house, waiting for a sign that Manuel is back. Manuel decides to keep fighting in court. His lawyer makes a Hail Mary legal filing and argues that the long history of death threats from his wife's relatives should be grounds for him to stay in the U.S. The chances it will work? Somewhere around 5 percent, Lino tells him. In mid-October, the judge issues her order. It's one page. It says her original decision overlooked the fact that Manuel was persecuted in Mexico because of his family relationships. The fact that those death threats came from family members gives him legal protection that he wouldn't have had if they had come from random strangers. She rules that Manuel can remain in the United States. It's called "withholding of removal." Not asylum, not a path to citizenship. There are lots of limitations — for instance, Manuel can't leave the country and must pay a yearly renewal fee. But the upshot is: Manuel can go home, back to V and their children. Their oldest son is in shock. "It's just such a powerful feeling," he says. "It's powerful because of what you believed in came true, it's actually happening now. ... It was powerful because my birthday just passed and all I wanted was my dad." Manuel's release comes a few days later. 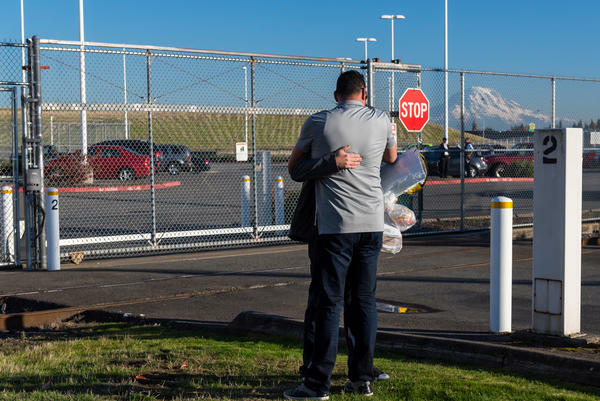 He walks through a chain-link gate, over a railroad track and outside the detention center for the first time in months. He waits at the bus station for an overnight Greyhound ride home. V texts him the whole way. The two oldest sons are waiting in their car outside the bus station. They're shaking. And then, they see their dad. "I just didn't know what to say," the oldest son says. "It was that kind of shock where you can't even let it come out. ... I couldn't decide if I wanted to be like, 'Hey Dad, what's up? It's been awhile.' Or it's like, 'Hey Dad, I missed you so much.' "
Manuel hugs his boys. They cry. Manuel says the 10-minute drive home from the station feels like forever. He walks through the gate to the yard of their modest single-story house, past the trampoline and dog toys lying in the fresh snow. The last time he walked through the gate, daffodils were blooming. He is also the exception. For most immigrants who enter deportation proceedings, the ordeal ends with a flight to a different country. Last year, the United States deported 226,000 people. If Manuel hadn't had a lawyer, or if the death threats were from random people, and not family members, he probably would have been deported. But his family has not emerged from the experience unchanged. The last few months have left some scars. Manuel says his younger boys still cling to him, afraid he'll have to leave again. And several months after his release, Manuel says he still hasn't received the proper papers to work. As a result, the oldest son remains the family's biggest breadwinner, and his schooling is left on hold. Congress continues to debate the future of DACA, so his future remains hazy, too. And after negotiations to solve that issue crumbled in Washington last week, it doesn't appear that a solution will come soon. Manuel says he knows that he broke the law and that his decision to come to the United States got his family into this mess. But he doesn't regret it either. "I'd do anything for my family, and everything I've done until now has been for them," he says. "And I'm going to keep doing it, so they can be somebody in this life." 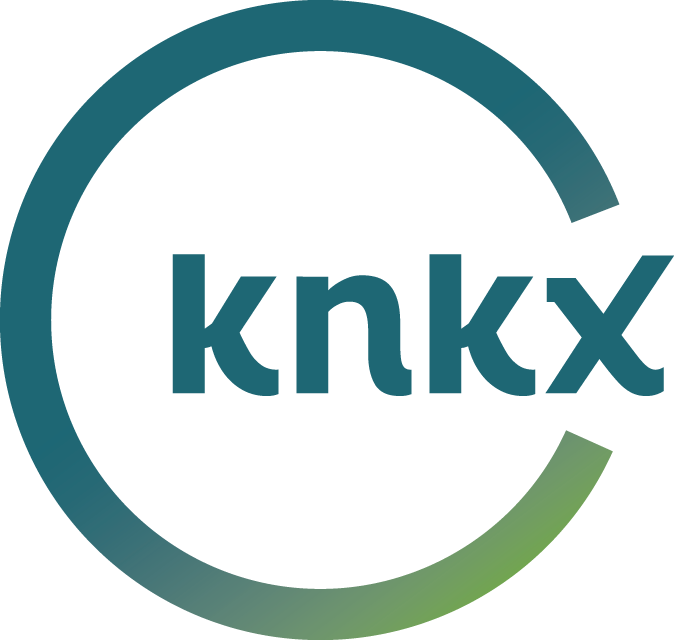 This story was produced for broadcast by Sam Gringlas and Christina Cala, with help from Ana Lucia Murillo and Matt Ozug. The story was edited for broadcast by Jolie Myers and for the Web by Maureen Pao. In the year that President Trump has been in office, immigration has defined his political platform from the first day of his campaign to this week's government shutdown. And the numbers show that he has made some dramatic changes. Immigration arrests in the U.S. interior, meaning far from the border, went up 25 percent over this past year. We wanted to understand what the giant, complicated immigration enforcement system looks like to one family caught in the middle of it, so we've spent months reporting this story, gathering documents, sending producers to be there for all the unexpected twists and reversals. And we've waited to tell you this story until we knew how it ended. SHAPIRO: It's a bright September day in the Pacific Northwest. We're in the backyard of this single-story home, tossing a squeaky toy with a slobbery pit bull named Royce. That's his real name. The family asked us to change some other names and keep certain details vague because of their legal status. When you walk through their front door, the first thing you see is a wedding photo - a teenage bride and groom in Mexico. SHAPIRO: We're going to call them Manuel and V.
And on the frame with the photos from your wedding, it says together forever. V: (Through interpreter) In our hearts, yes. Though we're not together in person right now, in our hearts we are. When you truly love someone, there are no barriers. SHAPIRO: By now you might have guessed Manuel is in immigration detention. We've watched his absence ripple through his family and community in ways that continue today. The first time we meet the family in September, Manuel has already been locked up for five months. His boys range from 19 to 8 years old. The oldest has temporary protection under the program called DACA. He was brought over as an infant. The younger three are U.S. citizens. SHAPIRO: Alex looks younger than his 14 years. He's enthusiastic with big appetites and big emotions. He's been learning the accordion. SHAPIRO: What song is that? ALEX: It's one of my dad's favorite songs. SHAPIRO: Oh, what's it called? ALEX: It's called "La Puerta Negra." SHAPIRO: What does that mean? ALEX: It's a song about relating to my parents' story. A guy fell in love with a girl, but their parents wouldn't let her be with him. So it's about a door that was just blocking their love and stuff. SHAPIRO: Here's how that relates to his parents' story. Manuel and V were born in Sinaloa, Mexico. They went to elementary school together. When they started dating as teenagers, V's family objected because Manuel's family was poor. Her relatives had connections to the Sinaloa drug cartel, and they tried to kill Manuel. Over a couple years, they beat him up, put a gun to his head and tried to run him over with a car. That's all according to his testimony in immigration court. Those death threats will turn out to be important later in the story. In 1998, he crossed the border and got caught in the U.S. He could have asked for asylum, but he was 19. He didn't understand immigration law. So ICE issued a deportation order, one that still stands today, and he was sent back to Mexico. Three days later, he crossed into the U.S. again, and he's been quietly flying under the radar ever since, working and raising a family until one day last April. At 5:30 in the morning, a local police officer came to Manuel's house with immigration agents. We spoke to Manuel on a crackly phone line from the Northwest Detention Center just south of Seattle. MANUEL: (Through interpreter) And the official said, OK, turn him around, and arrest him. And I asked him why. I understand a little bit of English. And the official said in Spanish, OK, you have a deportation order from 1998. SHAPIRO: The cop said the officers came to investigate a report that Manuel was driving a stolen car. When Manuel told them he owned the car, the immigration agents demanded his citizenship papers. Then they put Manuel in handcuffs. Incidentally, police could not produce any report about that stolen car. MANUEL: (Through interpreter) I asked, please let me say goodbye to my wife. And the other official in Spanish said, OK, go ahead. Say goodbye. They took me towards her, and he let me say goodbye, but I haven't seen her since. SHAPIRO: He never got to say goodbye to his kids. Fourteen-year-old Alex remembers that he went to sleep excited the night before. His first football game was the next day. The morning of the game, he woke up to the sound of his mother screaming, and his father was gone. ALEX: Once they took him, my grades went down. ALEX: They didn't let me play as much in my games because of my grades. SHAPIRO: Your grades went down, and so they wouldn't let you play as much. ALEX: It was just very hard. SHAPIRO: In the five months that Manuel has been locked up, the family has had to change all their routines. The oldest son dropped out of college. There was no money for tuition, and he needed to support the family, so now he's working as a firefighter. At the same time, he doesn't know what his own future will be. He has temporary permission to stay in the country under DACA. The fight over renewing that program is part of what led to this week's government shutdown. In the detention center, Manuel feels helpless, unable to provide for his family or comfort his children. He tries to talk to them on the phone every night. MANUEL: (Through interpreter) They ask me when I'm going to come back. It's very sad, very sad. SHAPIRO: What do you tell them when they ask that question? MANUEL: (Through interpreter) I tell them they have to put a lot of effort in school 'cause they don't have to pay for my mistake. They don't have to pay for something that I did. SHAPIRO: We got his Immigration and Customs Enforcement file. And since his illegal border crossing nearly 20 years ago, Manuel has not been charged with any crimes. He had three jobs to support his family - restaurant work and cleaning. The detention center where he's staying is supposed to be for holding people, not punishing them. But to Manuel, the place feels punishing. When he was picked up in April, 750 people were on hunger strike, protesting the conditions at the Northwest Detention Center. Now in September, I ask what it's like inside. MANUEL: (Through interpreter) The bathrooms are horrible and in really bad shape. And the food is also really awful. Sometimes I've seen animals in our food, people's hair in the food. It's awful. A lot of people get sick here because of the food. SHAPIRO: The company GEO Group which operates the detention center told us they strongly deny these allegations. Every time I call Manuel, he says he's hopeful and confident that he'll be reunited with his family. 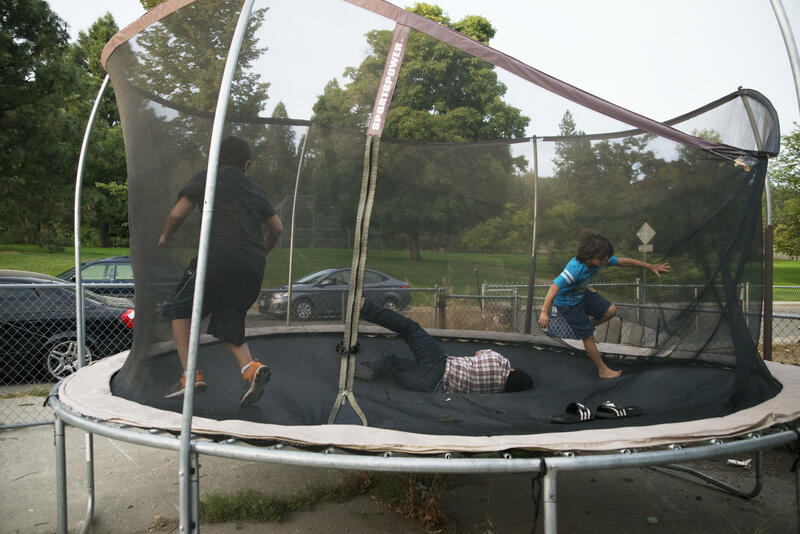 His optimism gets tested every time one of his friends in detention gets deported. Many of them have cases just like his. MANUEL: (Through interpreter) One of them was just deported two weeks ago. That goodbye was the hardest for me because he also has his family here. SHAPIRO: And so when you saw him leave, when he was deported, you must have thought, that could be me. SHAPIRO: President Trump has promised to put more people in immigration detention, and that means expanding ICE priorities to go after people who weren't targets before. The Department of Homeland Security asked Congress for money for 17,000 new beds. That's a one-third increase. Under President Trump, ICE agents got a memo that, quote, "officers will take enforcement action against all removable aliens encountered in the course of their duties." The man who wrote that memo is Matt Albence. SHAPIRO: Ari Shapiro - great to meet you. He's the director of enforcement and removal operations at ICE. I sat down with Albence at his office in Washington, D.C. He's been at the agency for six years. And as he sees it, officers had their hands tied under the Obama administration. ALBENCE: The laws that Congress has passed and that our officers are sworn to uphold - we are now executing them faithfully across the board. SHAPIRO: He told me about 90 percent of the people ICE arrests have a prior run-in with the courts. But that 90 percent includes Manuel because he had a deportation order for crossing the border about 20 years ago. If somebody listening to this interview crossed the border illegally a number of years ago and has tried to be as good an American without being an American as they can be in the years since then, what's your advice to them? ALBENCE: If they're here unlawfully and they have a form of or a process for which they can acquire legal status through a family member, through a business, whatever the case may be, then they should avail themselves of that opportunity. ALBENCE: And if not, then they should realize that they run the risk of being arrested, being placed in removal proceedings and ultimately, at the decision of a judge, being deported the end of those proceedings. SHAPIRO: So do you have any advice for somebody who realizes they're at risk of that? ALBENCE: My advice would be - anybody that's in violation of the law - stop violating the law. SHAPIRO: Does that mean self-deportation? ALBENCE: It's certainly an option. SHAPIRO: It's not just policymakers in the Trump administration who feel this way. SHAPIRO: Just down the block from Manuel and V's home in the Pacific Northwest, we stop by a yard sale to talk to some of the people looking through used clothes and furniture. It's a crisp afternoon, and lawns are scattered with fallen leaves. UNIDENTIFIED MAN #1: Give you another card to give to your friend. SHAPIRO: This is a working-class community where the population is overwhelmingly white. Mark Hite tells me he's glad to see ICE enforcing the immigration laws. MARK HITE: Change the law if they want to come in without legalization. But if it's illegal, it's illegal. We're a country of laws. It ain't right for them to get away with the law if I can't go rob a bank. SHAPIRO: So the story that we're reporting is about a guy who came here illegally 20 years ago. HITE: Why don't he go down and get papers now and get signed in? SHAPIRO: There's no program to do that. HITE: Oh yeah, there is. Yes, there is. You can go down and get immigration papers. Do it like everybody else does it comes to the country. SHAPIRO: So now he's got four kids here. Three of them are U.S. citizens. He's been working three jobs. He's not been accused of any crime in the last 20 years, but he's being deported. HITE: Should've got here legally. He should have done it the legal way, and then he wouldn't be getting deported. See; that's the bad thing. It's the law. It ain't my choice or your choice. It's the law. SHAPIRO: At last in mid-September, Manuel's court date arrives. He's been locked up nearly half a year. If he loses today, the next time he leaves the detention center could be with a one-way ticket to Mexico. UNIDENTIFIED WOMAN #2: We are on the record. SHAPIRO: The kids are in the courtroom, saying prayers, hoping their father will be able to come home with them when this is all over. The hearing goes on for hours. And finally they hear these words. SHAPIRO: Manuel's application to stay in the U.S. is denied. These are the words everyone was hoping not to hear. UNIDENTIFIED WOMAN #3: ...That respondent shall be removed from the United States. UNIDENTIFIED MAN #2: I mean, I'm angry, upset and confused mainly. SHAPIRO: This is the oldest son, the one who left college to support the family. We're not using his name because his future under DACA is uncertain. A few minutes after court gets out, we get him on the phone, and he tells me his father was rushed out of the courtroom so quickly they couldn't even make eye contact. UNIDENTIFIED MAN #2: I couldn't even say bye, especially after they told him, like, I couldn't even, you know, look him in the face and say bye. That was pretty painful. But I know as the time goes, I'll figure a way out of it. SHAPIRO: Manuel calls his wife, V, in despair and tells her to send all his clothes to Mexico so when he's deported, he'll have something to wear. She empties out his closets. There is one small sliver of hope. Manuel can ask the judge to reconsider. That might take months, time that he would spend locked up. The alternative is to accept deportation and try to start making some money in Mexico for his family in the U.S. Even the oldest son's relentless optimism seems to be failing him. UNIDENTIFIED MAN #2: He has the right to appeal, but it almost seems unnecessary and almost seems like no matter what he does, they're going to, you know, [expletive] reject him. SHAPIRO: What does this mean for your family? UNIDENTIFIED MAN #2: Hell if I know. Who knows what's going to come? I mean, if things go down, I mean, I might as well leave, too. I might as well go back to a country I've never been to. You know, this is the American dream, you know? We're living it. SHAPIRO: Manuel decides that if there is any tiny chance that he can see his wife and children again, he needs to keep fighting. He does have one thing going for him that most immigrants in the system don't. After the deportation ruling, a lawyer named Andrea Lino takes on his case. ANDREA LINO: They need to decide if we are going to appeal what our options are. SHAPIRO: Eighty-five percent of immigration detainees don't get lawyers, and it makes a big difference. Detainees without lawyers only get released about 10 percent of the time. Those with lawyers get out a little more than 40 percent of the time. In Mexico, Manuel's elderly mother gets a phone call at her home. The Sinaloa Cartel has been watching. The caller says Manuel was deported and kidnapped at the border. The caller demands a ransom and threatens to kill her son. Manuel's mother knows that this is a bluff. She knows that her son is still locked up in the U.S. But she also knows that the threat of violence is real. Manuel's lawyer makes a Hail Mary legal filing. She argues that the long history of death threats from V's relatives should be grounds for him to stay in the U.S. Manuel asks what she thinks his chances are. LINO: Realistically, I'd say 5 percent. SHAPIRO: In mid-October, the judge issues her ruling. It's a one-page order. It says the deportation order overlooked the fact that Manuel was persecuted on account of his family relationships. The fact that those death threats came from family members gives him legal protection that he would not have had if they had come from random strangers. The judge grants Manuel withholding of removal. In other words, he can go home. MANUEL: (Through interpreter) You feel like your heart is coming out of your chest. I'm very happy - such good news after so much time. SHAPIRO: This is not asylum, not a path to citizenship. There are lots of limitations. But the upshot is Manuel can live with his family again in the United States. SHAPIRO: This is Ari from NPR. As soon as we hear the news from the lawyer, we call the oldest son. He's still in shock. UNIDENTIFIED MAN #2: It's just such a powerful, like, feeling. It's powerful because what you believed in came true. And then it was powerful because my birthday just passed, and all I wanted for my birthday was my dad. SHAPIRO: Nine days after the judge issues her order, it's late-October, the morning of Manuel's release. We sent a producer to record his first steps back into the world. A guard opens a big, sliding gate. Manuel wears a gray jacket, a cross necklace around his neck. The mountains loom over the detention center in a bright, blue sky. His lawyer is waiting. She applauds and gives him a big hug. SHAPIRO: That afternoon, Manuel boards a Greyhound bus for a long overnight ride home. There's snow on the ground. The last time he saw his wife and kids, daffodils were blooming. V can't believe this is real. V: (Through interpreter) I couldn't sleep waiting for him to arrive. And where are you? And how are you? We were texting all night. MANUEL: (Through interpreter) When you get there, when you're going down and you see the whole city, it was like I was coming back to life. UNIDENTIFIED MAN #2: Me and my brother in my car shaking were like, man, where do we go? And then we see just, like - at the very, very back corner, I just see my dad. I couldn't tell whether I wanted to just, like, be like, hey, Dad, what's up? You know, it's been a while - you know, just have, like, that one, like, bond we had before he left. Or it's like, hey, Dad, I missed you so, so much and, you know, just hug and cry and stuff. SHAPIRO: They hug in silence. For one member of the family, Manuel's return is a complete surprise. The slobbery pit bull Royce goes nuts with the kind of joy only a dog can express. SHAPIRO: The younger kids still seem shaken up even after their dad has been home for a week. Manuel tells me he has to keep reassuring them. MANUEL: (Through interpreter) They're still worried. Yesterday morning early, Isaac came into the bed with me, and he was hugging me, and it made me cry again. SHAPIRO: We're in the kitchen now. Pork chops and soup are on the stove for dinner. Manuel laughs that among other challenges, he doesn't have any clothes to wear. UNIDENTIFIED WOMAN #4: He said, "I don't have any clothes 'cause my wife sent it to Mexico." UNIDENTIFIED WOMAN #4: Because he told me to. He ordered me to. SHAPIRO: When will they be back? MANUEL: These are my son's clothes. SHAPIRO: These are your son's clothes. What? SHAPIRO: In the last year, more than 226,000 people were removed from the United States for being in the country illegally. Manuel is the exception. If he didn't have a lawyer or if the death threats had come from random people instead of family members, he probably would have been deported. He sits at the dinner table in the Pacific Northwest with his wife and his boys. They close their eyes and hold each other's hands. ALEX: Dear God, thank you for the meal that we're about to receive. Thank you for letting my dad be at the dinner table once again. Thank you for letting my whole family be together once again. Amen. SHAPIRO: Manuel is out of detention, but his family's struggle is not over. He still doesn't have the paperwork that will allow him to work in the U.S. His oldest son's future depends on whether DACA is renewed. But after all this, Manuel says he doesn't regret his decision to cross the border almost 20 years ago. He says everything he's fought for has been for his family, and he's going to keep fighting for them. 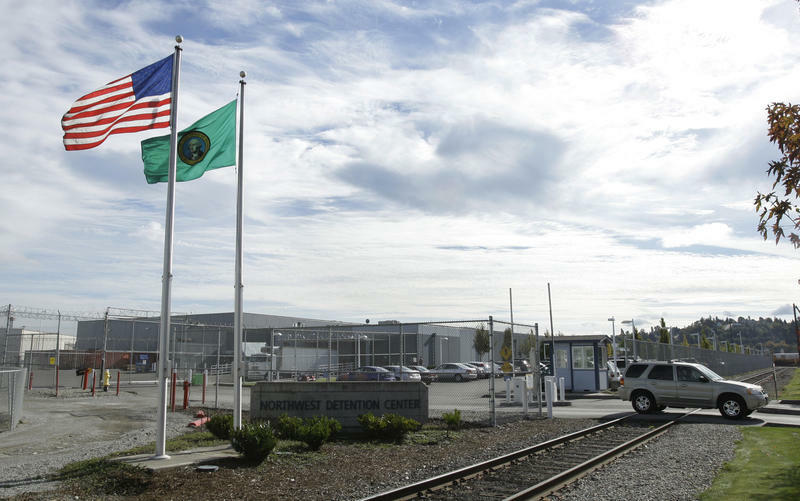 Tacoma officials are considering limits on any future expansion of the Northwest Detention Center, the region's only detention center for immigrants facing deportation.